Not strictly native to Britain, but traces have been found on Neolithic sites and it was certainly known in Roman Britain. It is native to central and eastern Europe and became a well known plant in this country by medieval times. The genus name, Helleborus, is Greek in origin and came to represent any plant used to cure madness. Hellebore comes from the Greek elein (to injure) and bora (food), indicating its poisonous nature. The species name niger comes from the black roots, for centuries believed to be a cure for insanity, mania and melancholy. According to Gerard a ‘purgation of Hellebore is good for mad and furious men’. Also held to be powerful agent against evil spirits, Hellebores were often planted as close to the entrance to the home as possible to ward off assorted devils. Medicinally it was used as an effective purgative and treatment for worms but it was a powerful one, sometimes inadvertently killing the sufferer. It was often a treatment chosen for dropsy (water retention) and amenorrhoea. All parts of the plant are extremely toxic if ingested. The roots contain cardiac glycosides similar in effect to those found in Digitalis. Helleborin and Helleborcin are both powerful poisins and strongly narcotic. Like so many plants in the middle ages it had a wide range of applications including as a treatment for lice and a means to bring on an abortion (it stimulates both the heart and the uterus). The root would have been harvested in autumn and then dried and ground to a powder. The powdered root can also cause violent sneezing. 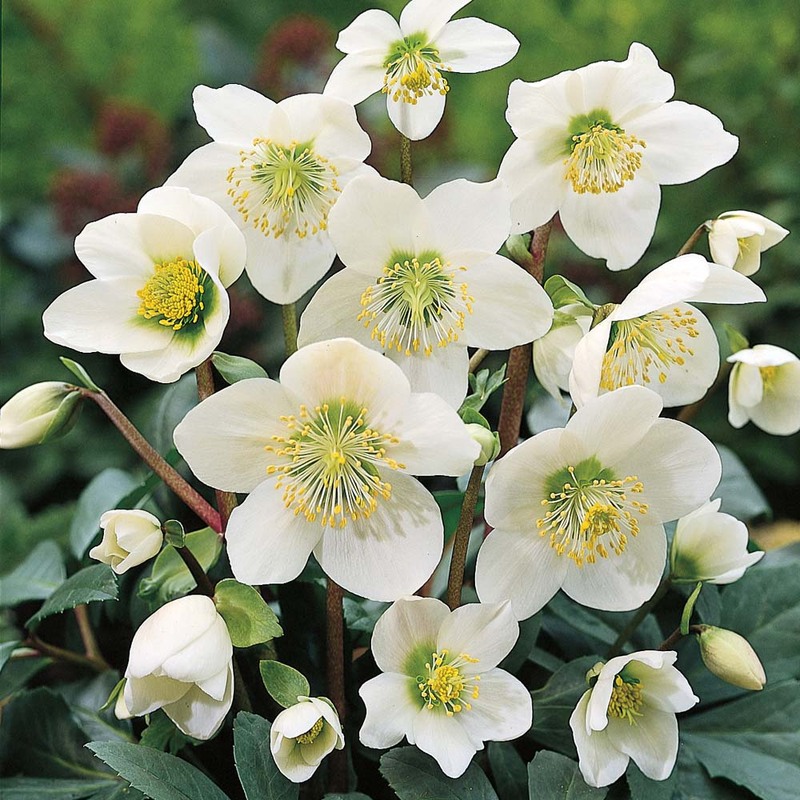 Christmas rose is a semi-evergreen perennial growing up to 30cm, with leathery dark green leaves and pure white or pink-flushed white, bowl-shaped flowers up to 8cm in width. It thrives in neutral to alkaline soils that are moist, fertile and humus-rich, ideal for heavy clay in partial shade. Provide shelter from strong, cold winds. Mulch annually in autumn. Propagate by seed in pots in a cold frame as soon as seed is ripe or by division after flowering in early spring or late summer.